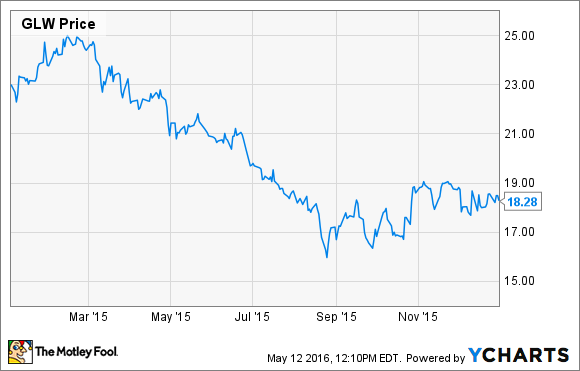 Is Corning's Drop a Buying Opportunity? The glassmaker's stock has taken a recent hit. Does this mean it's a bargain...or too big a risk? The drop practically wiped out all of the stock's gains for the year and could certainly be cause for concern. But it also might be an opportunity to pick up this year's stock at last year's prices. 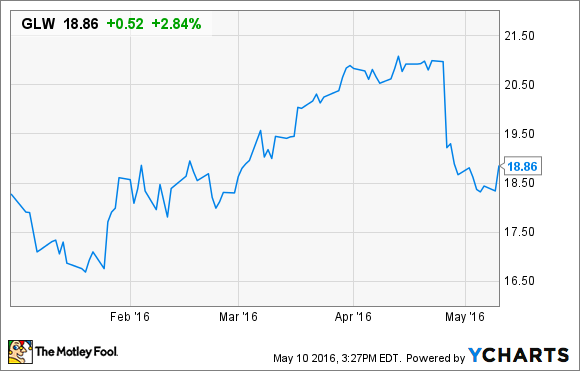 Let's take a closer look to see if Corning might be a buy. Corning is essentially a materials science company; it's just that the material is glass: glass panels for TV screens and smartphones, glass fibers for Internet cable, even spun-glass filters for automobiles. This singular focus on one particular material means it isn't really a competitor of broader materials science companies like 3M (NYSE:MMM) or DuPont (NYSE:DD). 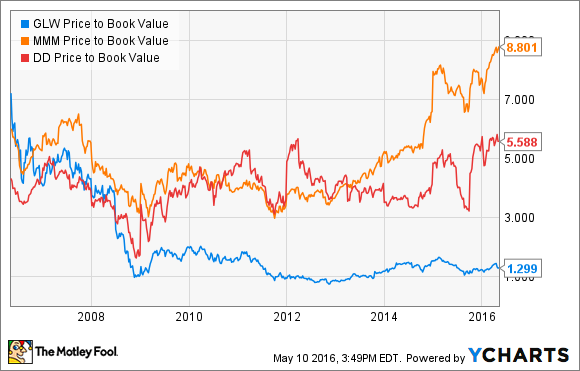 GLW Price to Book Value data by YCharts. As you can see, Corning's blue line is low. Unbelievably low. I even checked it against some other industrials like General Electric and Honeywell, and it's the lowest by far and has been since the Great Recession. By this measure, at least, the stock is nowhere close to being overvalued. However, that doesn't necessarily mean the stock is a buy. It's useful to check price-to-book against return on capital employed, because investors will naturally pay a premium for a company that gets a good return on its capital. 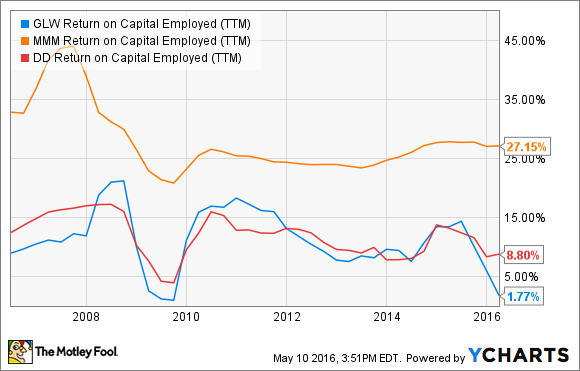 GLW Return on Capital Employed (TTM) data by YCharts. Logically enough, Corning's ROCE is much lower than the others' as well, although it has dropped significantly since 2015. Prior to that, it had been similar to DuPont's, even as DuPont's price-to-book was higher, signaling that either DuPont was overvalued, or Corning was undervalued, or both. Regardless, the company's current 1.3 P/B ratio seems fitting given its 1.8% ROCE...which sat at nearly 15% just a year ago. What happened? Luckily for Corning, the display market seems to be improving in 2016. The Q1 revenue miss had nothing to do with display technologies or TV screens: a software problem prevented the company's optical communications unit from fulfilling orders. The problem is largely resolved (and, because optical communications only represents 15.6% of the company's profits, didn't result in a Q1 profit miss). Still, at least for the time being, Corning is at the mercy of the global TV markets. It's concerning that a big industrial is deriving so much of its profits from a single source. Even worse, just three customers make up 62% of the display technologies sales. Which means that (assuming roughly equal margins are derived from each customer), about 45% of Corning's profits come from just three customers. Losing even one of them would have a devastating effect on the company's bottom line. Corning is a far more speculative play than 3M or even the soon-to-be-merged-and-then-split DuPont. It's far too dependent on just a handful of customers in one industry for the bulk of its profits. To buy it is to believe strongly that its fortunes will improve. Luckily, the company is putting its R&D to good use, finding new markets for its glass products. Its advances in auto glass and organic light-emitting diode (OLED) screens look particularly promising. And while you're waiting to see if those technologies pan out, the company will pay you a nice dividend (currently about a 2.9% yield). The logjam in the optical communications division is largely resolved, but the stock hasn't yet recovered. Although it's a bit riskier than 3M, DuPont, or other big industrials, investors who like to be rewarded for their patience will find a lot to like about Corning. At these prices, it's a buy for those willing to stomach the inherent risks.